Samsung Galaxy Tab gets official | Android Blast! Samsung has jumped into the tablet market with the now official Galaxy Tab. Samsung today announced the launch of the Samsung GALAXY Tab (Model: GT-P1000). Powered by Android Operating System 2.2, the Samsung GALAXY Tab is the first of the company’s tablet devices, representing a new category of mobile products for Samsung. "Samsung recognizes the tremendous growth potential in this newly created market and we believe that the Samsung GALAXY Tab brings a unique and open proposition to market. There is a new and emerging consumer demand that Samsung can satisfy since mobile is in our DNA. This demand continues to grow and develop as users tap its limitless potential," said JK Shin, President and Head of Mobile Communications Business, Samsung Electronics. "The Samsung GALAXY Tab has been designed to enable consumers to maximize their online experience wherever that may be. The Samsung GALAXY Tab is pushing the market in new directions and Samsung believes this is only the beginning of its innovations as pioneers in smart media devices." 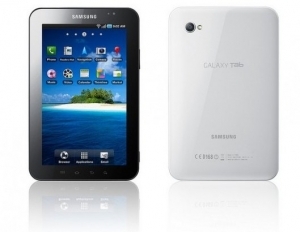 The Galaxy Tab will run Android 2.2 on a 1 GHz Cortex A8 processor. It has a quad-band GSM phone featuring HSUPA 5.76 Mbps / HSDPA 7.2 Mbps radio (900, 1900, 2100 MHz). It sports a 7-inch WSVGA screen with multitouch and all the usual wireless networking with Wi-Fi a/b/g/n and Bluetooth 3.0. It has includes GPS. The Galaxy Tab features front and rear cameras, but the rear camera is only 3 megapixels. That seems low considering other devices have 5 and 8 megapixel caermas these days. Hit the source link below for more info from Samsung.